Links to this page can be found in Book 7, Day 2, Map B2 and Rione Monti. In 1756, at the time of this etching by Giuseppe Vasi, Strada Pia, the street opened by Pope Pius IV to link Piazza di Monte Cavallo (Quirinale) with Porta Pia, could have been called pia strada (pious street) because its eastern side was occupied by a series of monasteries and nunneries; the church of S. Andrea belonged to a Jesuit friary, but it is commonly named S. Andrea al Quirinale with reference to its location. The view is taken from the green dot in the 1748 map below. In the description below the plate Vasi made reference to: 1) S. Andrea al Quirinale; 2) Monastero delle Monache (nuns) Cappuccine; 3) Monastero delle Monache Dominicane; 4) Piazza di Monte Cavallo. 4) is shown in another page. The dotted line in the small map delineates the border between Rione Trevi (upper part) and Rione Monti (lower part). After the 1870 annexation of Rome to the Italian Kingdom, Palazzo del Quirinale became the residence of the royal court. The presence of so many religious buildings was in contrast with the very lay policies and legislation which characterized the first fifty years (1861-1911) of the new kingdom. In 1888, on the occasion of a visit to Rome by German Emperor Wilhelm II, it was decided to redesign the surroundings of Palazzo del Quirinale and two nunneries were replaced by a public garden. S. Andrea was spared because of its artistic value, but the adjoining monastery was confiscated and turned into a building which houses public offices. Another change relates to the obelisk placed by Pope Pius VI in 1786 at Piazza del Quirinale. In 1566 a small medieval church dedicated to St. Andrew was donated to the Jesuits who also acquired some adjoining properties, including S. Vitale; they built a new church which incorporated the old one, but in 1653 they decided to replace it with a larger building; Pope Innocent X, however, denied the authorization, on the grounds that it was not appropriate for the Jesuits to have an imposing church near the palace of the Pope; in 1658, Prince Camillo Pamphilj, nephew of Pope Innocent, convinced Pope Alexander VII to grant the authorization, which was obtained, but with two provisos: a) that the new church should be built at a certain distance from Strada Pia and that it should be screened from it by a wall; b) that the Jesuits should seek the advice of Gian Lorenzo Bernini, the Pope's preferred architect. The construction of the church was completed in 1661, but it did not have a proper façade; after the death of Pope Alexander VII, the obligation to hide the church behind a wall was forgotten and in 1670 Bernini designed the façade with a coat of arms which was included by Filippo Juvarra in his selection of papal coats of arms (the image used as background for this page is based on a preliminary sketch by Juvarra). The "What's New" icon in the left column of this page shows a detail of a large stucco composition in S. Maria in Aracoeli which Bernini designed in 1634. It shows two Fames holding a celebratory inscription. 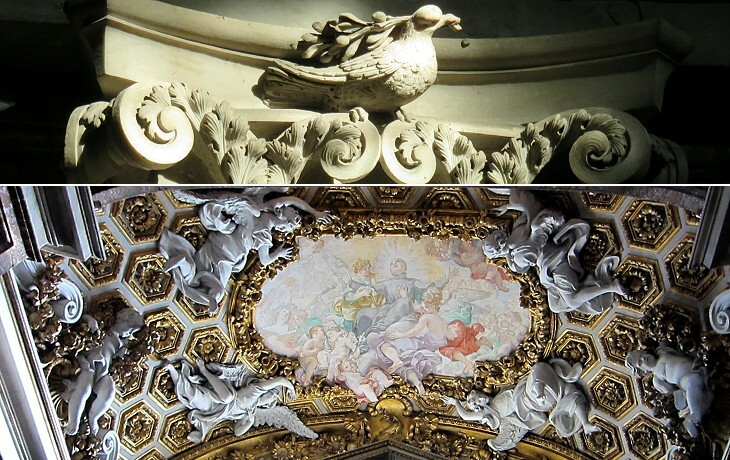 By comparing the two works one can see the "technological" improvements made in the use of stucco. Bernini believed that this lightweight material was particularly suited for statues of angels and other flying creatures/objects which had to be placed at the top of walls or in ceilings. 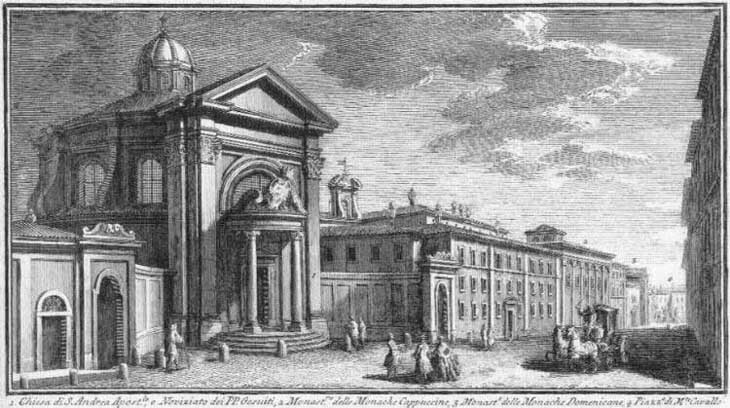 In 1634 Bernini designed a small elliptical church inside Palazzo di Propaganda Fide, but a few years later it was pulled down to make room for a chapel designed by Francesco Borromini; it is possible that Bernini built on that early project or on an elliptical hall he designed at Palazzo Barberini to develop the design of S. Andrea al Quirinale (not to mention the elliptical shape of Piazza S. Pietro). Bernini began his career as a sculptor and he probably would have ended it as a sculptor if Pope Urban VIII had not had such an admiration for this young man and commissioned him the construction of his family palace and the design of the interior of S. Pietro. Bernini had to become a manager and to select a team of assistants, many of whom worked for him their whole life. 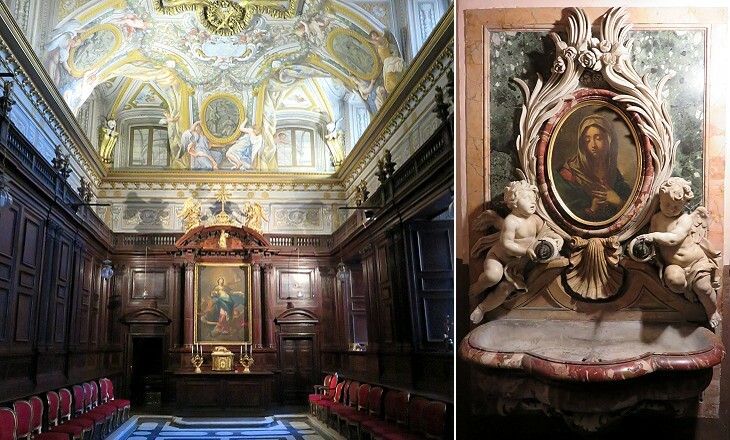 The "Bernini Workshop" included sculptors, painters, gilders, joiners, etc. and S. Andrea al Quirinale is one of the best results of this team, together with Cappella Cornaro at S. Maria della Vittoria. For centuries the ancient Roman monuments were regarded as an endless source of marbles and other stones which could be used for the decoration of churches and palaces, but in the second half of the XVIIth century this source started to dry up. 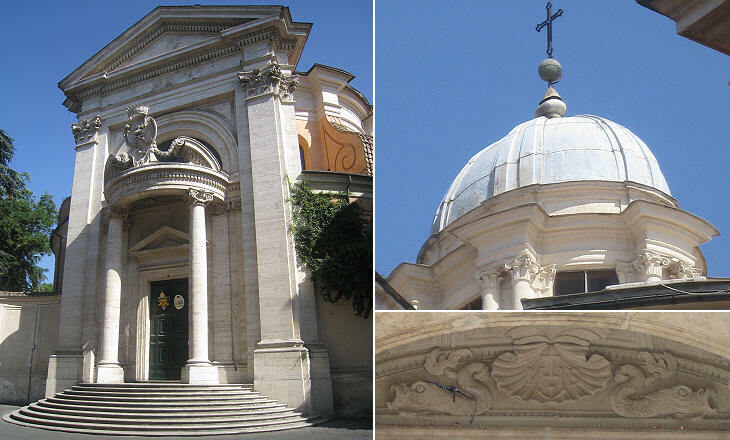 Bernini did not want to use ancient columns of different size and colour for the decoration of S. Andrea, so he used a stone from a quarry at Cottanello, near Casperia in the Apennines. The quarry was exploited in antiquity, but it was abandoned until the 1640s when it was reactivated. 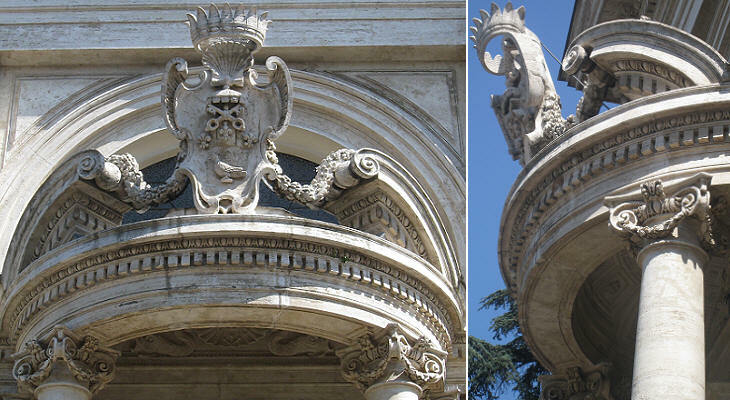 Cottanello columns were placed at the sides of the Monument to Pope Alexander VII, another work by Bernini. Bernini used four large cottanello columns to act as a screen between the elliptical shape of the interior and the apse with the main altar. The apse receives light from a small dome which is not visible unless one moves very near the altar. Yet the decoration of its lantern was by no means careless. 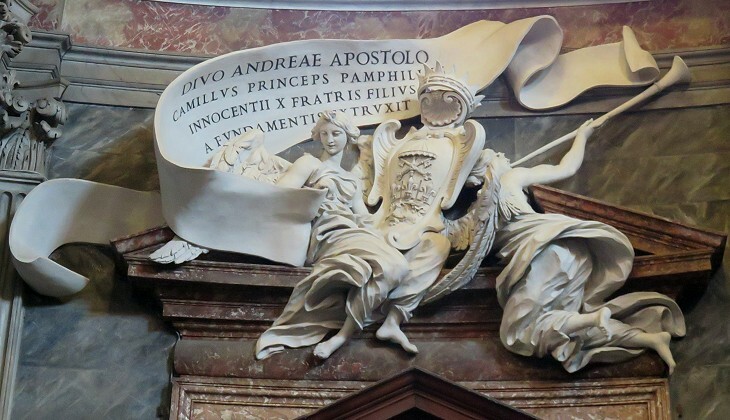 Bernini regarded S. Andrea al Quirinale as his finest work, where he was able to express his talent to its full extent. 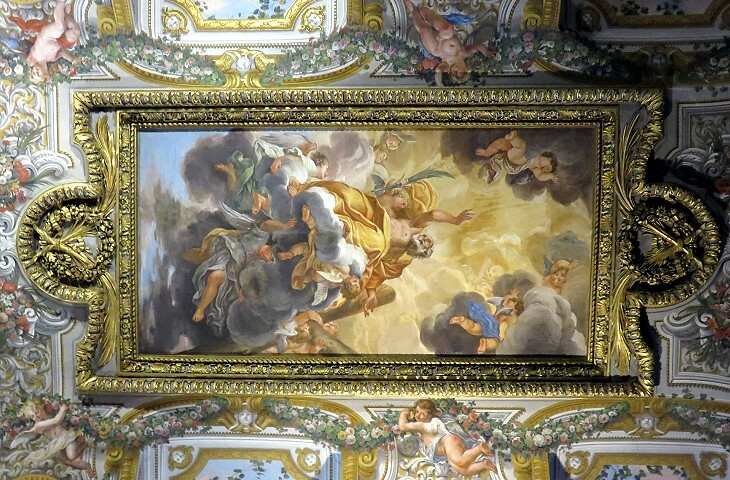 All along his career he had successfully managed to be highly rewarded, but he did not want to be paid for his personal contribution to the design of S. Andrea al Quirinale. 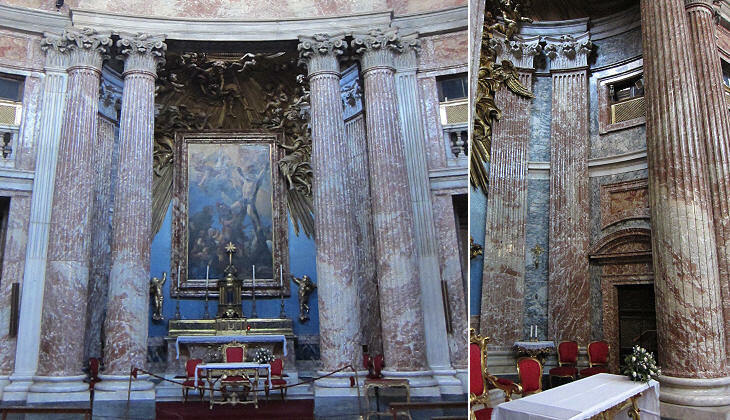 St. Stanislaus Kostka was canonized in 1726 and the decoration of his chapel was completed shortly after. He was a Jesuit novice at S. Andrea for ten months before his death at the age of eighteen in 1568. He came from Poland and he joined the Order against the will of his family. The building where he lived does not exist any longer, but visitors can see some rooms with works of art and relics related to his stay in Rome. Bernini designed many large funerary monuments, but he did not want them at S. Andrea because they would have damaged the architectural lines of the building. That ban did not apply to the floor which houses some elaborate gravestones. Cardinal Giulio Spinola belonged to a very rich and influential Genoese family. 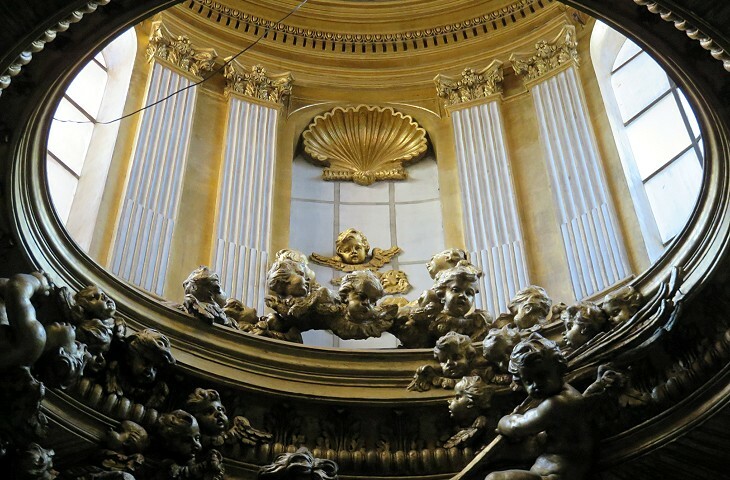 He died while he was attending the conclave of 1691 in nearby Palazzo del Quirinale and he was buried at S. Andrea where in 1719 Cardinal Giambattista Spinola iuniore was also buried (there have been thirteen Spinola cardinals). The gravestone is a mix of two mosaic techniques: the putti and the Virtue holding a cornucopia are made up of small pieces, similar to a Roman floor mosaic (see houses at Pompeii), whereas the coat of arms of the Spinola and the overall frame are an opus sectile work, which is formed by carefully chosen marble pieces of some size (see a detail of an opus sectile hall found at Ostia). 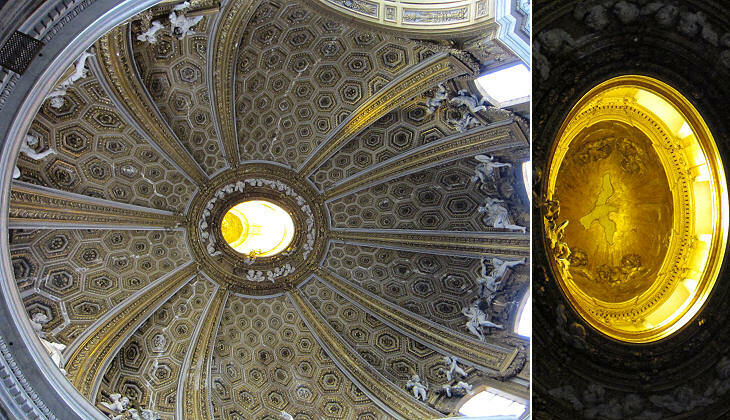 The same level of refinement characterizes the sacristy that was completed in 1670 under the supervision of Bernini. Ad maiorem Dei gloriam (For the greater glory of God) was a motto of St. Ignatius of Loyola, the founder of the Jesuit Order. It was eventually used to justify the lavish decoration of the Jesuit churches, in contrast with the views of other orders (e.g. the Franciscans). At S. Andrea the novices could see the implementation of the motto in all parts of the building, including those having a merely practical purpose. 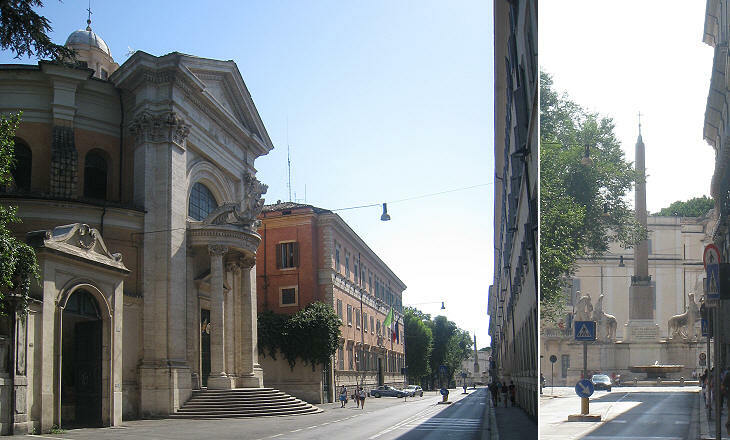 Francesco Borromini, Bernini's rival, designed S. Carlo alle Quattro Fontane, a church only yards away from S. Andrea along Strada Pia, so it is easy to compare the styles of the two leading architects of their time. "Italian Hamlet" is a famous appellation by the Italian poet Giosuè Carducci for Charles Albert, King of Sardinia; the king, although supporting constitutional reforms and the cause for Italian Unity had often shown an irresolute conduct, which eventually alienated him from the sympathy of many patriots. 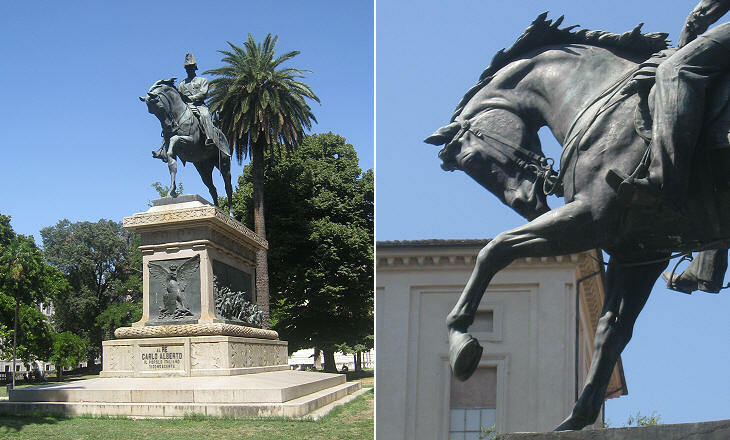 He redeemed himself during the First Italian War of Independence in 1848-849; perhaps because he was still regarded as a controversial figure, the monument to him was placed in the new gardens near Palazzo del Quirinale, a rather minor location. Next plate in Book 7: S. Carlo ai Catinari. Next step in Day 2 itinerary: Chiesa e Monastero di S. Susanna. Next step in your tour of Rione Monti: Chiesa e Monastero di S. Carlo alle Quattro Fontane. Dal Principe D. Camillo Panfili fu eretta questa chiesa l'an. 1678. col disegno del Cav. Bernino, il quale in poco sito fece prova del suo talento. Ella è di figura ovale ornata tutta di preziosi marmi, stucchi dorati, e pitture insigni. Il quadro di s. Francesco Saverio nella prima cappella a destra è opera del Baciccio; il Cristo morto e i laterali in quella, che siegue, sono di Giacinto Brandi; quello nell'altare maggiore è di Guglielmo Borgognone, e la statua di s. Andrea, che sta in alto, di Antonio Raggi. La cappella, che siegue, merita particolare osservazione per li marmi, ed altri ornamenti, che la compongono. Il s. Stanislao colla ss. Vergine è insigne pittura di Carlo Maratta, i laterali però sono del Cav. Mazzanti, e sotto l'altare si custodisce il corpo del santo Novizio entro una preziosa urna di lapislazzoli, e metalli dorati; il s. Ignazio nell' ultima cappella è di Ciro Ferri, e i laterali del detto Cav. Mazzanti. 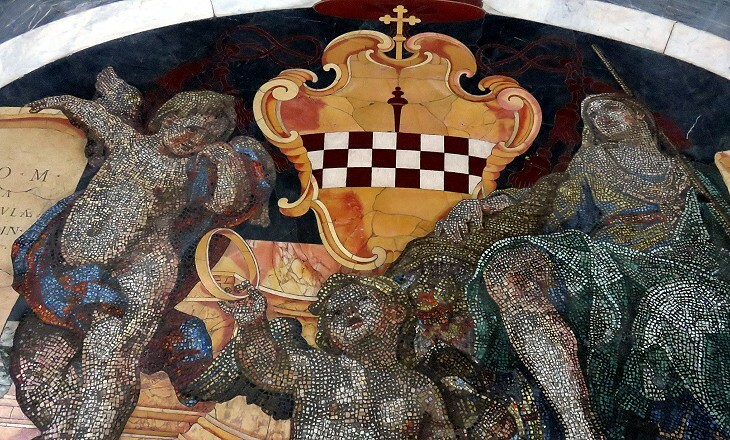 Nelle stanze superiori della casa vi è la cappella ove morì il mentovato s. Stanislao, la quale è degna di essere veduta per le ottime pitture, e molto più per la statua del Santo in atto di moribondo fatta di marmi diversi da Monsù le Gros.